With the Christmas day fast approaching we can’t wait for the festivities to start. House decorations, the tree, reruns of favorite holiday movies, quality family time, Christmas dinner... Ah, the dinner! A meal so special that it’s worth the year-long wait. There’re so many choices, too: from a roast turkey and stuffing to a persimmon pudding and hot chocolate. We see this feast of a lifetime and there go all our fitness and health resolutions. Counting the average calories consumed on Christmas day being the least of our worries. After all, it’s just one day. Can it really be that bad? Well, first of all, define ‘bad’. But in any case, it does send you back 5,300 calories. According to the rough estimate, this is an average calorie intake of a person on Christmas day. While normally women need to eat only 2,000 kcal and men – 2,500 kcal daily. A traditional Christmas dinner adds up to so much not because of what we eat, since the holiday food is generally considered a healthy and well-balanced nutrition. The problem is the quantity because the tables literally groan with food and we have the urge to try everything. Greasy extras and all the dense and yummy confections are also the ones to blame. On top of all, it never stops there. As a rule, the self-indulging attitude lingers well through the New Year’s Eve. We refuse to go anywhere without sandwiches made of leftover turkey with gravy-soaked bread for a week after Christmas. The last one may be an exaggeration. But, anyway, you can add another 3,500 calories for each day when you finish up your holiday salads and pies. The highest number of calories is in festive drinks and delish desserts. And getting back in shape after a splurge like that takes time. 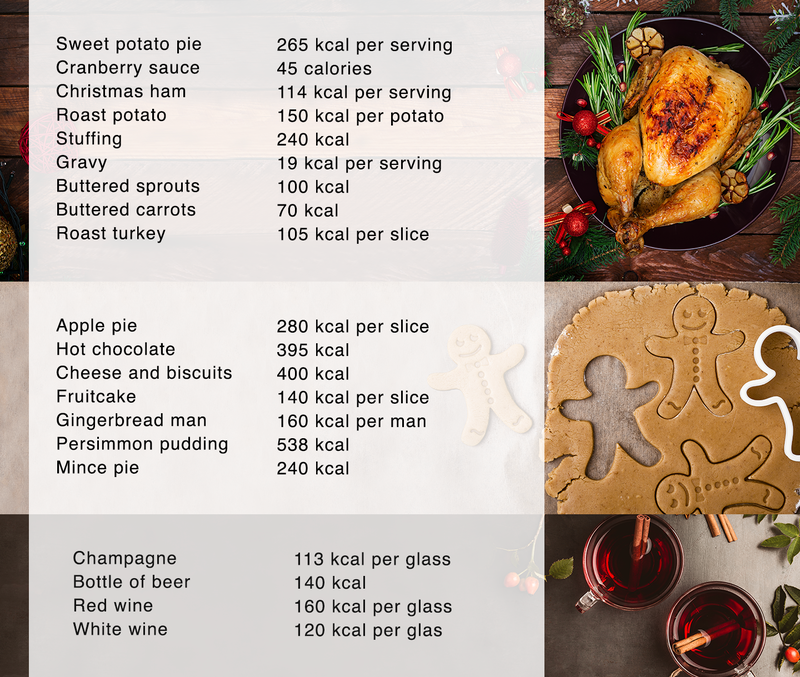 In case you are wondering how much exercise you really need to work off the calories of your Christmas dinner, we’ve calculated it for you. So, to burn off 5,300 kcal you’ll have to run a 25-mile distance, have 4 days of intense workouts and, to top it off, swim breaststroke for three hours straight. Be portion-conscious. Eat what you please but try not to get too carried away. Enjoy your turkey, as one of the best sources of lean protein but remove the fatty skin. Supplement your dinner with less traditional, yet healthier side choices (broccoli, kabocha squash, cauliflower, sweet potato and rice salad, quinoa stuffing, legumes). Fill your plate with fruits and vegetables so that there is less room for high-calorie meals. Drink freshly-squeezed juice instead of soda and, for example, Prosecco instead of mulled wine. use sugar substitutes (honey, maple syrup, stevia etc.) in all of your baking. It all comes down to this: if you don’t want to go overboard with all the yummy foods and drinks, simply go for moderation and some healthier ways. And maybe think about cutting down on calories some days after Christmas. One way or another, the holiday season might not be an appropriate time to adhere to a strict diet. It is the time to enjoy yourself and spend time with your loved ones over a delightful meal.